Another month, another fresh start! I love setting up a new month in the bullet journal because it’s like a tiny version of a new year without all the crazy pressure to make huge resolutions. 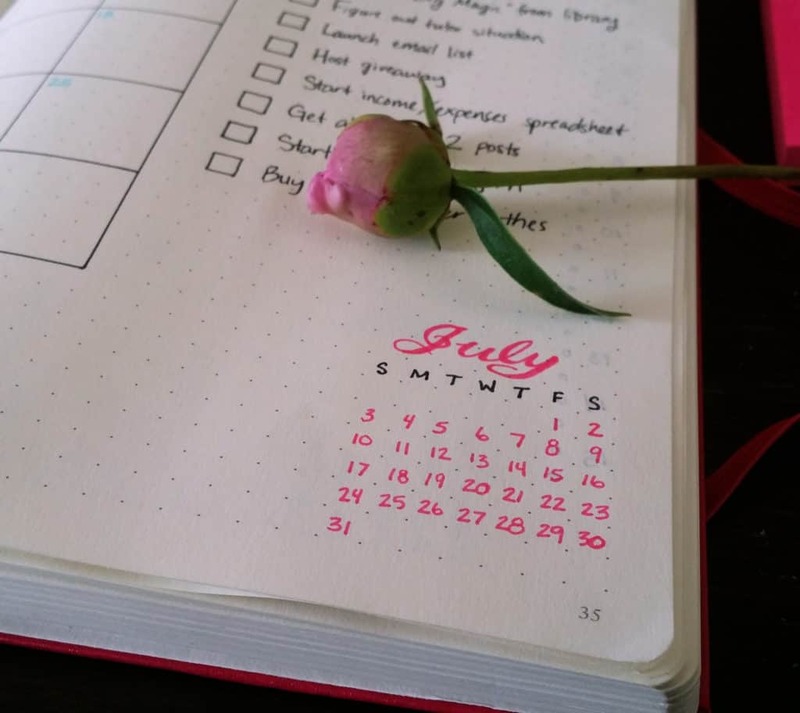 I like to look at the recent month and review all the things that didn’t work for me, any progress I made toward my goals, and what I want to try. So why don’t you take a look at my fresh set up? First things first, I have my ever-useful calendar. 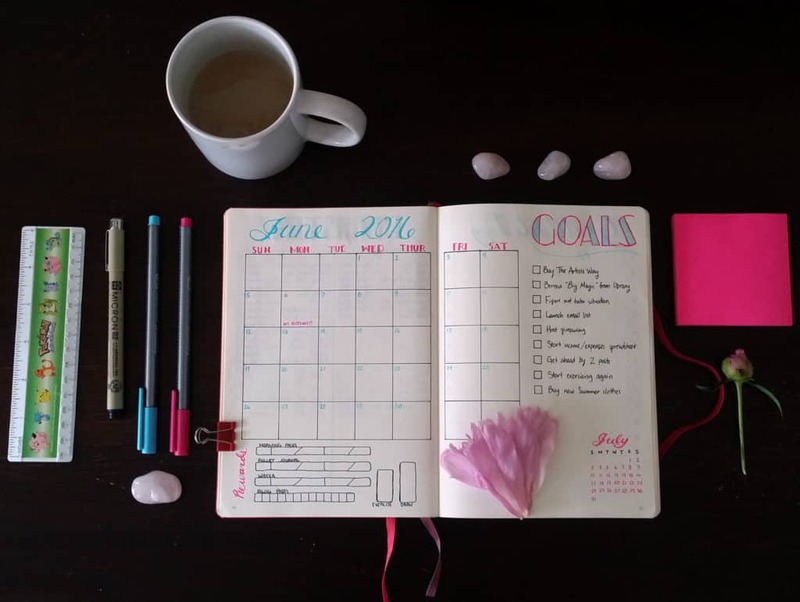 As you may know, I prefer to keep my bullet journal monthly spread in a more traditional layout rather than the method laid out in the original explanation of the bullet journal. I plot out my calendar with my Micron pens and write my overall goals for the month in the column next to it. As you can see, I have a lot to keep me busy in June! Under my calendar, I recently started drawing out progress bars for my personal goals, such as hydrating each day. I count each box in the dot grid as two days, which is why you see the lines through the progress bars. I divided each one into weeks so I can better see the breaks, because last month I had to keep counting from the beginning. I used slanted lines a bit, but I’m not sure if I like them. I might move away from that next month, but we’ll just have to see. Maybe that look will grow on me. At the bottom I have my little July seedling spread so I can look ahead at a glance. Some people don’t include them in their spreads, but I find it to be handy from time to time. Besides, I don’t like all that empty space, it feels unbalanced. I went with a color theme of pink and blue for this month because it feels summery and light. I used my Staedtler Triplus Fineliners and their brilliant colors to accomplish this look. I don’t know if I’ll ever be able to go without color again, these pens are so much fun! 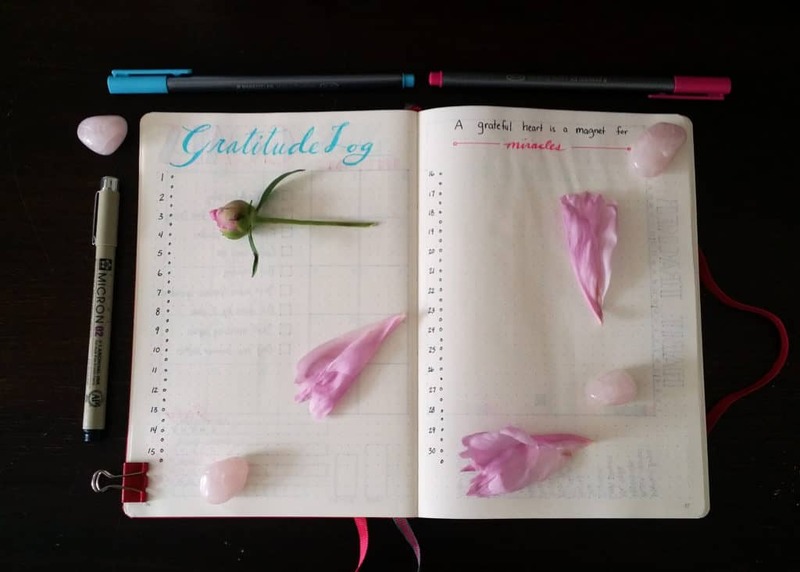 On the next page, I have my lovely Gratitude Log. I was inspired to add this to my bullet journal thanks to Kara from Boho Berry, who in turn got the idea from Kim at Tiny Ray of Sunshine. When something is this good, word gets around. This is a fabulous way for me to jot down a few things at the end of each day that I am thankful for. It’s a great way to stay mindful of the gifts I receive every day. Even when I have a terrible day at work and nothing has gone right, I can remember to be thankful for my husband, my dog, the food in my pantry or the shoes on my feet. This little log is wonderful for reminding me of that. You might notice the page is a little wrinkly. Hm….let’s dig a little deeper shall we? 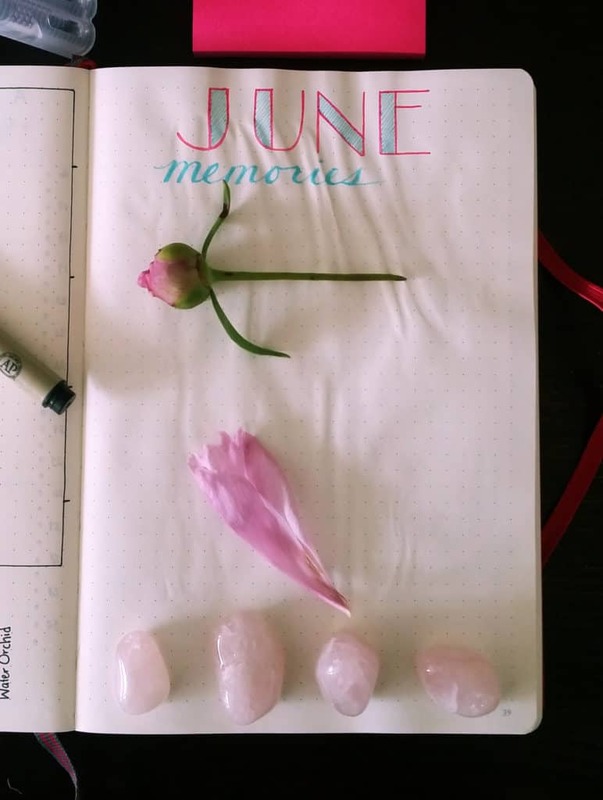 The next spread contains my fantastic Habit Tracker along with my June memories. 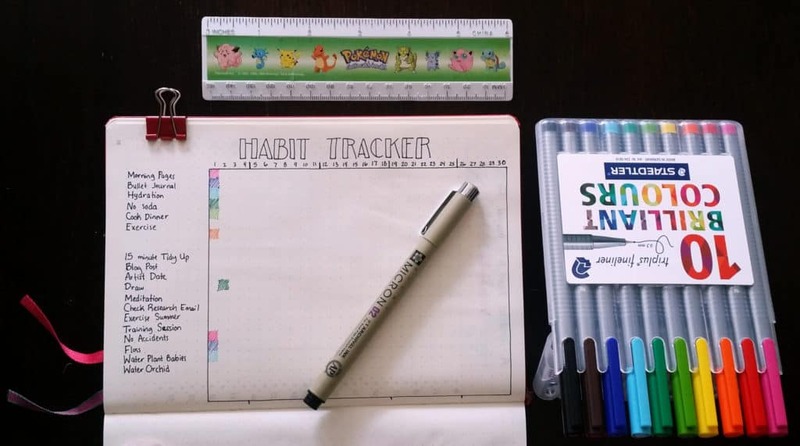 The Habit Tracker is an old and trusted friend, always reliable at holding me accountable for my bad decisions and celebrating my successes. I will have a Habit Tracker until the end of my days, I swear. I was a doofus and tried to glue BohoBerry’s challenge printable into my bullet journal with liquid Elmer’s glue instead of a glue stick,which is apparently the appropriate adhesive. UGH. It bothers me so much, especially because the wetness made some surrounding pages a bit wrinkly before I intervened. But instead of ripping out the page, I am just setting my jaw and accepting it as a lesson. That’s something I’ve had to accept over time- mistakes are okay and they happen to all of us. Learn from my foolishness! 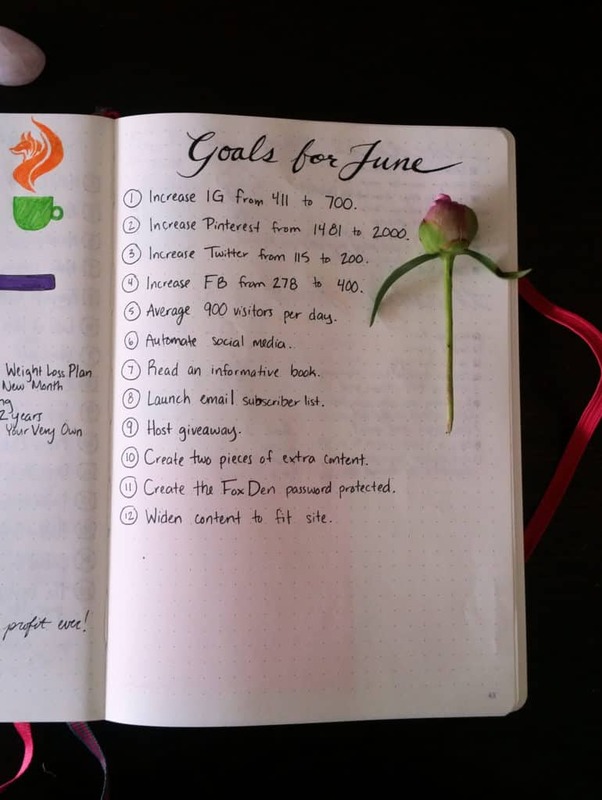 After my cringeworthy page of wrinkles, I have my blog stats and goals. Last month was the first time I wrote this out in my bullet journal, so this time I spread it out a little bit more. Last time I quickly ran out of room for writing goals, so I decided to give my blog goals their very own page next to my stats page. I like to draw out my logo with my Fineliners, but in the interest of keeping to my site’s color scheme, I have to borrow my purple Prismacolor illustration marker. Of course, while those are doing all the fun stuff, the Microns are hard at work doing all the outlines and writing. I’m happy to say that May was a wildly successful month, and I have you all to thank for that. So to all of you, thank you! You really make it fun to write and plan and play each day. Now that June is all set up, I am ready to take on the world and have more fun adventures, both with the blog and in real life. Hopefully I can start putting a real dent in my Summer Bucket List this month and have a wicked exciting summer. 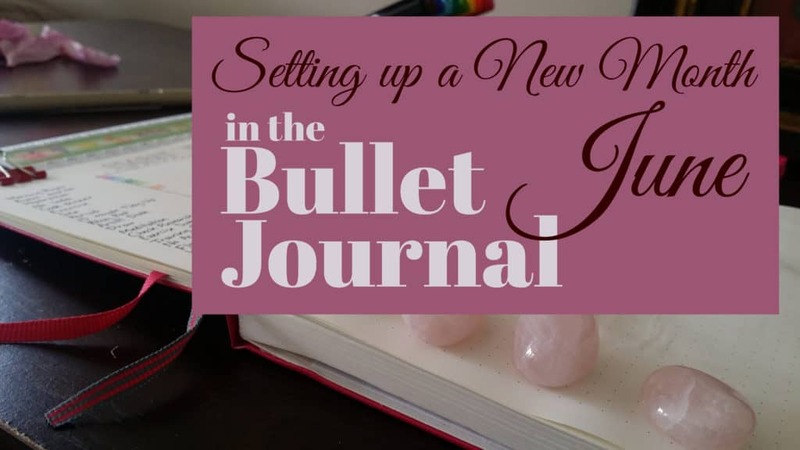 So how do you like to set up your month in the bullet journal? I’m happy to have found your pin. You have made getting started seem easier. I have one question, though. 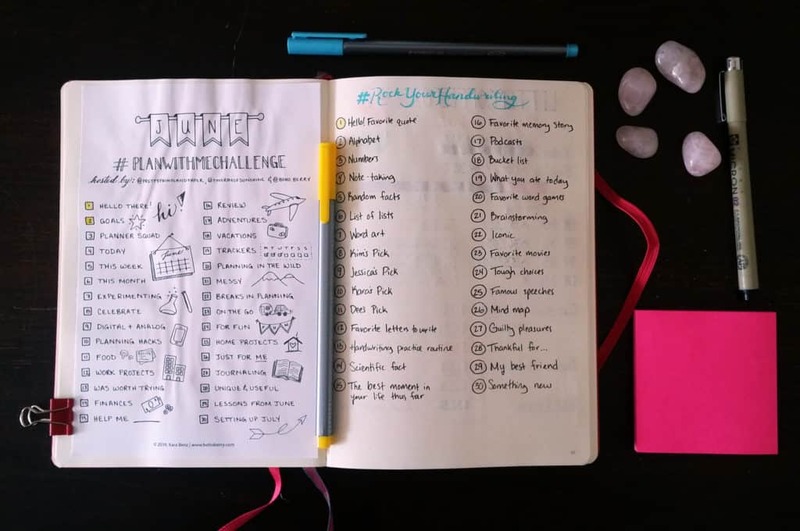 Do you use seperation journals for your monthly and daily entries or is it all in one? I’m glad you liked the post, Chanda! I put it all my planning in one journal so I can easily reference everything as I need it. I hope that helps, and good luck getting started! I like to use double stick tape instead of glue for pics or charts or anything I want to adhere in my journal. Although I do like the idea of just gluing the edge to insert a new page for some things. I really like your layouts. Thanks, Debra! I think I might go the tape route next time. Maybe it’s the excuse I need to buy washi tape! I learned the hard way with glue too! I just got a cute scrap booking page from Michaels and glued it with a glue stick to the back side. I was going to add something on top but it ended up just being a cute random design page to cover up my mess. Haha just an idea! I love your bujo! I’m glad I’m not the only one! I like your solution to this – If I ever find myself ruining a page again, I think I might need to go out and find some pretty scrapbook paper just for this. What a great idea, thanks for sharing! I am an avid pinterest-er and I’m am coming to the end of my first month of bullet journaling. I have come across several of your pins, leading me to your website. Thank you for all your advice and ideas. Your little mishap with gluing the printable into your journal inspired me to give you a tip, a trick that I’ve been use for a long time. 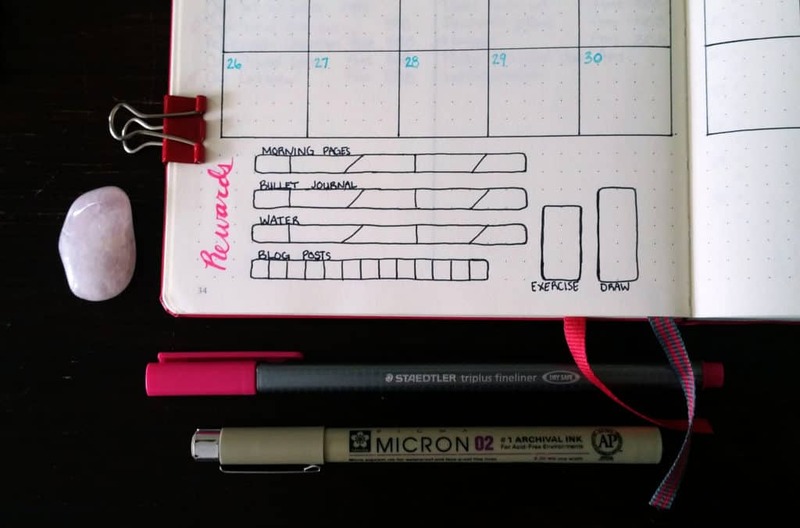 Instead of gluing down the whole printable and taking up a page in your journal, if you run one edge of the printable through your glue stick (so that a little bit of glue gets on both side of the paper) and then put that edge into the crease of your journal, you can add the printable as a whole new page to your journal. I hope that made sense. Also, if you’re looking for a purple Staedtler Fineliner. I bought a 6 pack at WalMart for less $7, that included a purple (it also had red, blue, green, black, and gray). That’s a great idea! I hadn’t thought of that, and that would definitely save space. Thanks for that fantastic tip! And I am still hunting for a purple (and gray, for that matter) Fineliner, so I’ll have to go poke around WalMart. That’s always tricky this time of year, though, because the school supplies are all on display and I struggle with self control around office and school supplies. I’ll have to send my husband instead! I know what you mean with schools and office supplies. There’s so much that I want but don’t really need. Exactly! It’s such a terrible temptation, but I just can’t help but covet all the paper and pens! I can’t believe that you are onlying 23. You are so wise and wonderful. Though I have just recently found you, I must read every post you have written. Thank you so very much for sharing you wealth of information as well as your bright Spirit. Marcia, you are making me blush! I’m glad you enjoy the website and I hope I can keep creating great content that helps people get better organized! Please let me know if there is any subject you want to hear more about. Thank you so much for your kind words! 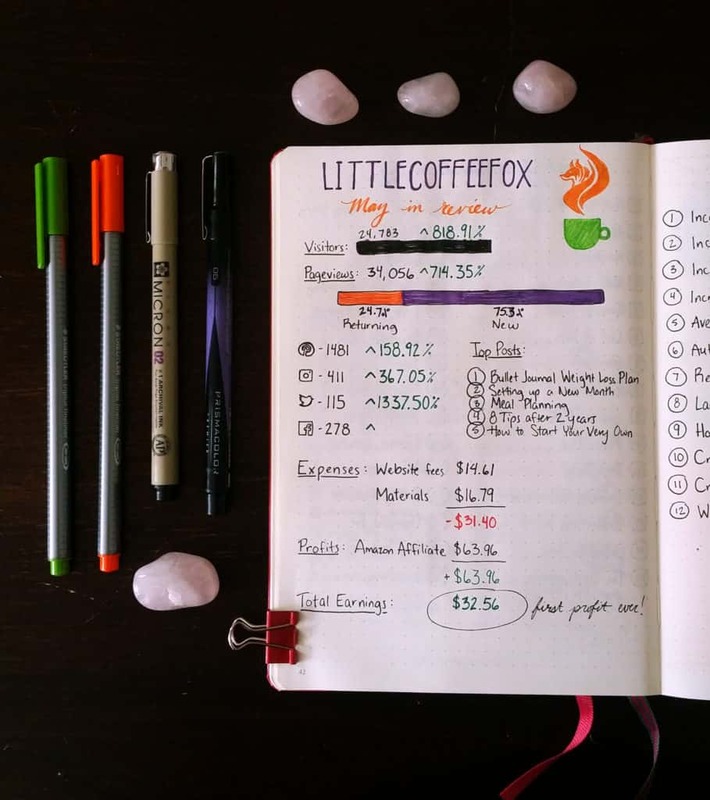 I like how you do your blogging stats in your bullet journal! I should start doing that to see how far I’ve come. It’s easy to forget!